While we were in the west coast of France earlier this month, we arrived at our host’s father’s house and waiting for us was a massive sea food spread he had prepared. I enjoy sea food, but there are something’s I stay away from. Snails (never had then before but didn’t look appetizing) and oysters (first experience was a sandy mess) being two of them. Nonetheless I wanted to be polite; the snail was simply just OK. I can certainly live without them, but now the oysters were a completely different experience. They were fantastic and reminded me of the ocean. 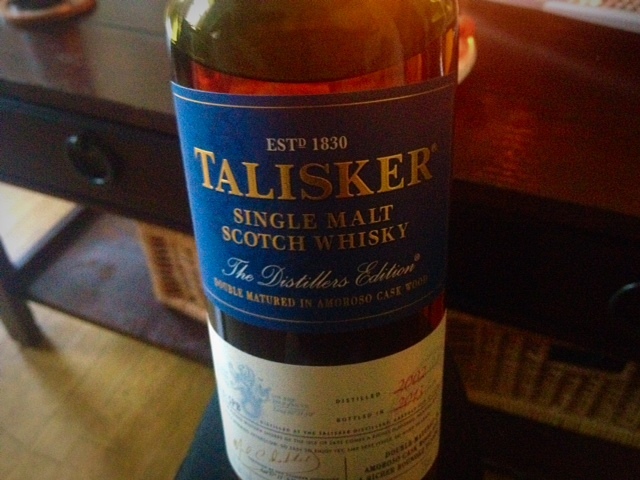 The ocean is exactly the word that comes to mind when I think of Talisker. That ocean taste is what keeps me going back to this amazing scotch. And if all oysters taste as great as the ones I had in the west coast of France then you better believe I want to eat more of them. The Talisker distillery is located on the Isle of Skye and it’s the only distillery on the Island. The distillery has been distilling for over 175 year and they always double distill their whisky. 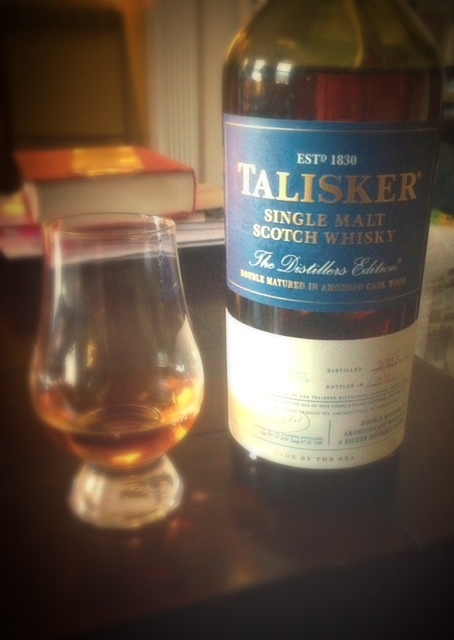 I first wrote about Talisker 10-year-old back in December of 2013, http://wp.me/p3Zt2k-3d. This Talisker Distillers Edition I got as a gift from my boyfriend’s brother. The bottle I received was distilled in 2002 and bottled in 2013 which comes to be around 11-years-old. It was also double matured in Amoroso Sherry Casks. This scotch, just like the 10-year-old, is extremely bold and strong, but smooth. As you would come to expect with any single malts from Islay and the Islands, it carries that signature smoky taste. There no question, I love this single malt. It would be perfect on a cold, rainy night or if you are like me then you will enjoy just about any time you want. I would highly recommend trying, however I do caution those who don’t drink whisky often or at all, it’s a strong whisky to start with. This unique single malt packs a punch but it doesn’t disappoint. This Distillers Edition is slightly more expensive than the 10-year-old as the price is around $65-$75 while the 10-year-old is priced at around $55-$65. I think it’s very worth it if you enjoy the signature Islay and Island notes. If you don’t, then this is definitely not the whisky for you.